Confused and not getting the results you were expecting. Hopefully you'll find an answer here. The display unexpectedly changes from Summary format to Display format then back to Summary format. I'm Searching the Content Page for a Name and Not Having Much Success. This is typically due to the database getting confused with what you've entered and is normally the result of typing too fast into the search box. The other possibility is you are experiencing a very slow internet connection so the database thinks you are typing too fast. To remedy this simply delete each letter from the search box slowly until it is empty. At this point every Will in the database should be displayed in Summary format. This can be confirmed by comparing the number of Wills found against the top line of the Update History. The numbers should be the same. Note you've just discovered how to display every Will in the database in Summary Format. On the odd occasion the numbers will not match. In this case the database is still confused. To remedy this situation reload the page. This is done by clicking on the Reload Button in you web browser. The Reload Button typically looks like a circular arrow. In Google's Chrome® web browser (above) you'll find the Reload Button at the top left, to the left of the web address. In FireFox (above) you'll find the Reload Button at top right, at the right hand end of the web address. In Safari® (above) you'll find the Reload Button at top right, at the right hand end of the web address. Once you click on the Reload Button you'll be presented with a brand new search page. There will be no Wills found and there will be nothing displayed in Summary or Display format. It is like you arrived at the page for the first time. Proceed as normal, but this time remember to wait after entering each letter and ensuring the database has responded by observing the number of Wills found change. Are you searching at the Name Search page? 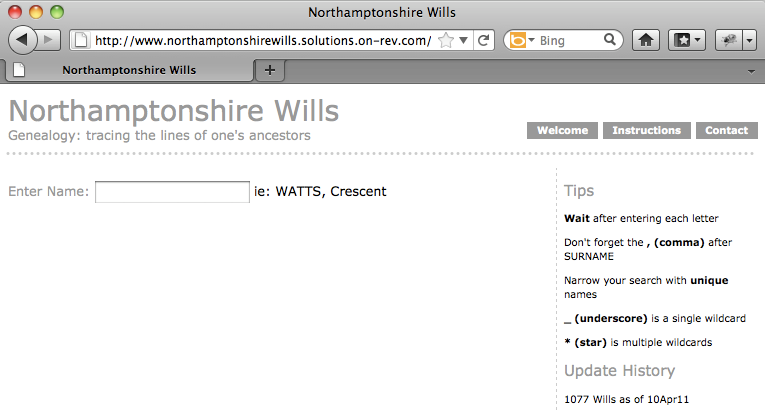 You can identify the Name Search page by the fact that it says 'Enter Name:' next to the search box, the Window title says 'Northamptonshire Wills - Name Search' and 'Name' is not a link on the top right menubar. If you do see 'Name' as a link in the top right menubar, then click on it and go to the Name Search page. If you are at the Name Search page and still getting 0 Wills Found, are you entering the names in the correct format? To carry out a successful search you must enter the SURNAME in ALL CAPS. This then must be followed by a ',' comma, and then any given names are first letter Capital only. Having said that, this does not apply if searching for names at the Content Page - see below. It's strongly recommended that you don't search the Content Search page for people's names. The Name Search has been specifically designed to aid this process. Firstly, you must appreciate that the Names within the Content portion of the Will appear just as they appear in the Will. Therefore it is not in the format SURNAME, First Second as they are nicely formatted in the Testator and Mentioned fields. So if you are going to search for HALBEATH, Ann you would need to search for Ann Halbeath. Now in this instance you'd be very lucky because Ann Halbeath will result in a single Will found. But you must appreciate that the vast majority of names in the Content of a Will are 'to my son John', or 'to my daughter Ann'. As such the majority of names in the content are First Name Only without a Surname. Doing a search on a First Name only ie Ann, results in hundreds of hits. Not very useful. Use the Name Search Page for what it's designed for. For the Wills to display in Display format the number of Wills found must be 20 or less if you are doing a Name or Place search, or 40 or less for a Content search. If you are searching for common names, this can be impossible to achieve. Instead you must identify unique names that happen to reside in the Wills you are interested in. To do this, review the Intermediate Lesson. Unfortunately Internet Explorer is too non-standard and it was not possible to build this website for every possible web browser. FireFox, Safari® and Chrome® are the most standards compliant web browsers available and this site was tested against those web browsers. This website is best accessed using either FireFox, Chrome® or Safari® web browsers. All are FREE.